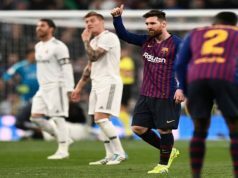 Cristiano Ronaldo grabbed the headlines for the umpteenth time in his career as he scored another brace as Los Blancos eased to a 5-0 win at Levante. Javier Hernandez, James Rodriguez and Isco grabbed the other goals as Madrid got off to the best possible start to a difficult week ahead as the face both Liverpool and Barcelona. 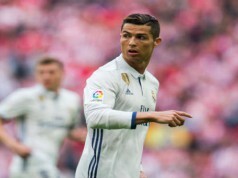 The 29-year-old Portugal forward went into the game having scored 13 La Liga goals in just seven games so far this season, and netted his 14th of the campaign after just 13 minutes, converting a penalty after on-loan striker Javier Hernandez had been brought down by Juanfran in the area. Levante reacted well to falling behind and enjoyed a spell of pressure. Indeed, they would have equalised if it had not been for a brilliant goal line clearance by Luka Modric from Diop’s effort. Ten minutes before the break, Carlo Ancelotti’s men found themselves further ahead, with Hernandez finishing off inside the area after being picked out by Rodriguez. Los Blancos continued to take control of the game after the break with the front three looking dangerous all afternoon. The three points were secured on the hour mark when Ronaldo netted his second of the day and 15th in the first eight league games, a new record, when he skipped past a number of defenders before finishing coolly. Things got better for the 10-time Champions League winners just five minutes later when summer signings Toni Kroos and Rodriguez combined for the Colombian to poke home Madrid’s fourth of the afternoon. And midfielder Isco put the icing on the cake with a sublime curling finish. Real have now won their last five league games and are looking stronger as each game goes – a good sign ahead of a huge week for them.